This is the first part of an article series to this topic on a library I wrote. At the end of this article you find links to the upcoming articles. The download can be found at part 2 along with a brief "user guide". With DSL Tools you get compartment shapes for your diagrams that look very much like the class-shapes in the graphical class designer of Visual Studio. These compartment shapes are very useful in many model designs and can visualize much information in a compact way. 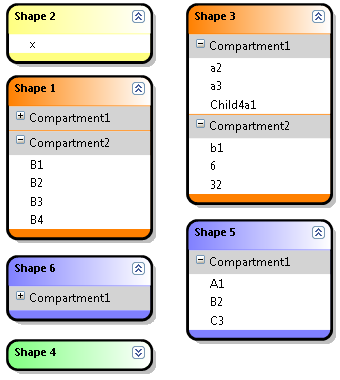 The user can collapse the whole shape (Shape 4) or single compartment lists (Shape 1, Shape 6) to save even more space on his diagram. "This would be a useful feature, but unfortunately it doesn’t fit into our plans for DSL tools V1. It’s something we’ll consider for the next version, though." What should I do? Change my DSL and make it complicated and less useful because of a limitation of the framework? Wait for an upcoming Version without a release date and without knowing that it will work for me? This all sounds like a very bad idea to me. So let’s change or extend the framework! Create connections between compartment entries of two different compartment shapes (or even within the same shape, if you like). 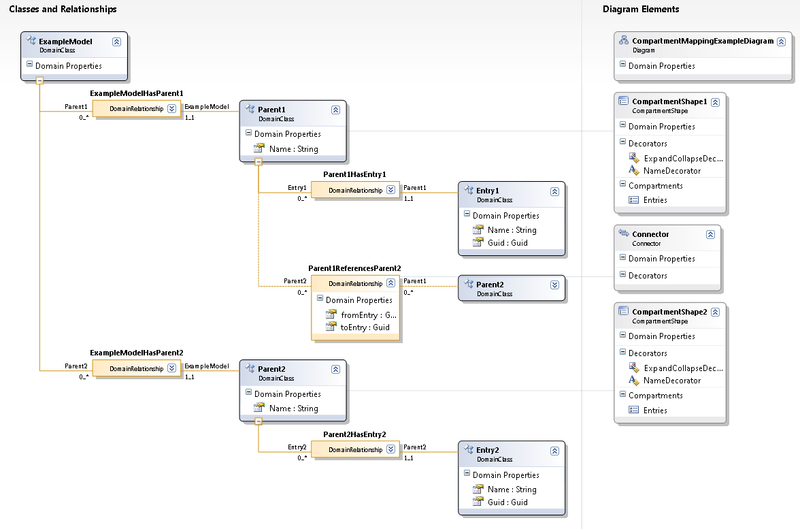 You can specify the allowed type of the source or target shape or select the same type for source and target. You can also constraint the allowed compartment entries by type if your source (or target) compartment shapes define more then one compartment group. 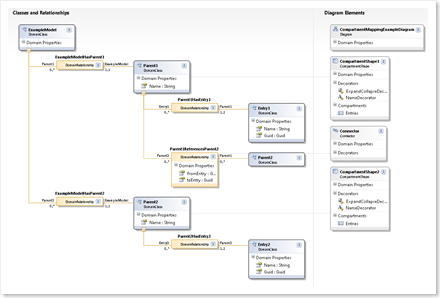 The user experience isn’t changed: The user creates this connections with drag and drop as usual in the generated DSL model designer. You can add code to write custom accept rules for this connection. You can decide how the information of the source and target entry is stored in the generated Domain Relationship. If you want, the whole compartment shape can be the source or target of a connection as well. This will be visualized through a connector from or to the head of the shape. One of source or target can be a regular shape. E.g. you can create a connector where the source is a compartment entry of a certain compartment shape and the target is a regular geometry or image shape. 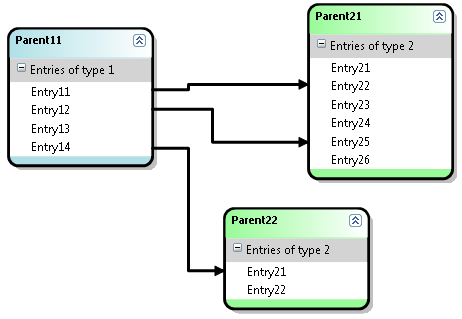 Since the update (see top of article) both source and target can be a regular shape, too or a base class mapped to a regular and compartment shape. All other properties, extension points, configuration, visualizations and so on will be used from DSL Tools. Since I can not change the code of the DSL Tools framework and libraries and I want not change the generated code in your DSL project (this will be overwritten each time you generate it) I started to write a library. To use this library in your DSL project you have to design some elements in your DSL as described by me later on. It is curial to set certain properties or it will not work as expected. Then you have to add come code to your DSL project to extend the partial classes generated by the DSL Tools code generator. To minimize the amount of hand written code I created a code generator as well. With this generator you need only to specify the connection you want to use as a compartment entry connection. Then only one class with three methods is left to be filled with code. Obviously the connector have to start on the left or right side of the shape just besides the corresponding compartment entry. Every time you change (add or remove entries; collapse or expand the shape) or move the compartment shape this connection points will be recalculated. The routing of the connector may change when this happens, but it will always use the routing algorithm you already know within the DSL editors. To ensure a correct visual presentation of the connector the user MUST NOT change the routing! For every connector under the control of my library the user CANNOT change the routing. – In my opinion this is a small price for the features you can add to the DSL framework. This article showed the basics of what my library can do. In the next article I will give you a brief user guide on how to provide this functionality to your DSL developments. The download of the library, the source code and examples will be there as well. In the last part I will explain a way of finding and removing some default commands from the DSL editor. As a professional software developer you will come one day to the point where you want to generate some source code or text files instead of writing it yourself. I don’t speak about dynamic web pages or big frameworks with code generation. But I bet in some of your last projects you could generate some code, too. Maybe you do this already with a codegenerator of some kind or by using a scripting language like PHP or Python. Maybe you have reasons not to generate it and write it by yourself. Very often these reasons are bad reasons: you don’t know any adequate tool, you don’t want to buy one or you don’t have the time to learn it. The first time I had to generate source code we wanted to generate a library to access the data of an external software in a type safe way with real properties and not throwing around with strings. The input was a xml configuration file of this software. For this aim we used a freeware code generator named CodeSmith. CodeSmith is a templating engine using C# or Visual Basic as embedded language and a syntax that is very similar to ASP. You can use all .Net framework classes and function within your template, load your own or 3rd party libraries into it and use all these classes as parameter of the template. A few years later we had to generate code again and discovered that CodeSmith became a company that sells an enhanced standard and professional version of the well known tool. They added a very powerful IDE to create and edit your templates and for the professional version Visual Studio integration and an API to use the engine with your templates in your applications. After buying the professional version we discovered that we cannot use CodeSmith for our needs. We wanted to build a product that generates code for the end-user on his machine but you are not allowed to distribute the CodeSmith libraries that are needed when you use the API. It took a long time for me to imagine a good usecases for an API like this if I cannot give my software away (or every user of my software has to buy a $399 licence of CodeSmith). Fortunately the old freeware version was capable of this. It can compile your template to C# code that runs without any external reference or library. You can add this code to your application and that’s it. You do not have the fancy IDE (or you can buy a CodeSmith licence and use the IDE but process your template with the freeware version – the syntax is nearly the same) and maybe not all of the features of the new version but it is free and works. The freeware version is still downloadable on their webpage. Visual Studio 2008 (aka. Orcas) comes with its own templating engine that is a free part of every Visual Studio Professional or Team System installation (free as in: you paid for it with your Visual Studio licence). This engine is powerful with C# (or even C# 3.0) and Visual Basic as language and access the whole .Net framework and external assemblies as well. Unfortunately there is no editor integrated in Visual Studio for the TT files. And even worse, you cannot use the engine out of the box. The DSL Tools use it but if you want to do so, you have to write code and access the public interfaces. But for both drawbacks there are solutions. You can download a beta version of the T4 Editor. It integrates in Visual Studio (the download for the Beta 2 works fine with the final version of Visual Studio for me, too) and has syntax highlighting for template files. It comes also with some Intellisense, but only for the template syntax and not for code you write inside your templates. Then there is TTxGen that allows you to use every file you want as input for a template in a Visual Studio solution. It adds a template to the input file and generates the output from the input using the template. It’s really that easy. TTxGen is a very lightweight thing (only 45 kByte for the installer) because it delegates most of the work to the T4 stuff from Microsoft and adds only a few menus to Visual Studio. I had some trouble with the installation of the February 2008 CTP release. You can find my workaround at the discussions over at MSDN Code Gallery. For one of my DSL Tools add-on libraries I use TTxGen to generate code from a xml file. Later I will post an article with the source code of the template that can be used as an example. CopySourceAsHtml (CSAH) is a small and nice add-in for Visual Studio 2005 to copy the selected source code html-formatted to the clipboard. This is very useful if you want to paste this code into your blog (as I do here sometimes). Unfortunately the current version 2.0.0 does not work with Visual Studio 2008 out of the box, but it is very simple to get it running. The add-ins are located in below documents-folder in a path like this: C:\Users \Benjamin \Documents \Visual Studio 2005 \Addins. Just copy all files beginning with CopySourceAsHtml*. * to the corresponding folder for Visual Studio 2008: C:\Users \Benjamin \Documents\ Visual Studio 2008 \Addins. Now you have to edit the CopySourceAsHtml.AddIn file with a text editor: only change at two positions in this short xml-file the Version value from 8.0 to 9.0. After a restart of Visual Studio 2008 you should find the CopySourceAsHtml add-in in the Tools / Add-in menu and of cause in the context menu of the code editor.